← Easy Towels Are Easy… Except When They're Not. Should I be paying attention to who made my fabrics? 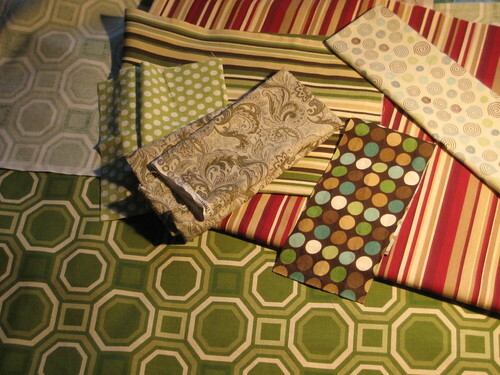 Many of the sewing blogs I read talk about “fun, fabulous fabrics by Amy Butler in the [insert fabulous name here] colorway!” I’ve never been one to consider fabrics, patterns or colors “fun;” I’ve been more of a dark/neutral/earth-tone sort of person most of my life. During my nearly-mandatory Goth phase at the University of Michigan, wearing anything brighter than a dark burgundy would have sent me into a spiraling fit of eye-rolling. Imagine my shock at discovering I love brint, funky, retro prints in really weird colors I have heretofore shunned. Despised, even. I remember my grandma Darling’s polyester shirts from the 60’s and 70’s in the odd, loud patterns springtime colors and thinking (even back then) they just weren’t my thing. I just look for what I like – honestly, I’ve no idea by whom any of these prints are. Perhaps, if I ever try to sell anything, I’d better pay more attention. Yesterday… I placed my first fabric order online. Sew, Mama, Sew’s siren song was finally strong enough to get my to cut my lashings, free myself from the mast and plunge into the waters of buying stuff I’ve never seen in person (or, more importantly, touched in person.) We’ll see how it all works out.